Cash-My-Check Chiang Kai-shek (蔣介石 Chiang Chieh-shih), 1887-1975, was a Chinese Nationalist and political leader of the Republic of China, and one of the most important Chinese politicians of the 20th century. Mirroring the rise of Qin Shihuang (though in reverse), his illustrious career saw his ascension to rule over up to half of the population and a quarter of the territory of China (1928-1937), up to a third of the population and fifth of the territory (1937-1945), up to half and a quarter again (1945-50), and finally, a rather small part of it (1950-1975). Born to a well-off family, a young Chiang decided to embark upon a military career, which turned out to be an exceptionally smart move when the fall of the imperial Qing dynasty in 1912 resulted in an prolonged period of clashes between warlords vying for power. Chiang studied at the Imperial Japanese Army Academy, where he joined the Kuomintang (KMT), the revolutionary nationalist movement headed by Sun Yat-sen, managed to get into the latter's good graces, and was appointed as the director of the party's newly established military academy (Ho Chi Minh being the academy's first Socialist Ideology instructor). Following Sun's death in 1925, he battled with Wang Jingwei and the KMT's leftist faction for control. In 1926, the Warlord Coalition on the north China plain disintegrated as Zhang Zuolin of Manchuria made a bid for control of Beijing. The Yangzi River warlords let them fight it out for a time, but then joined the coalition against Zhang when he took Beijing. By cutting deals with key warlords and using military force to take the territory of others, Chiang managed to conquer the mid-lower Yangzi at the cost of losing Guangdong to a former ally. Wang Jingwei and the leftists had only a third of the KMT military under their control, but were recruiting from their independent and wealthy base in the mid-Yangzi. Chiang decided to nip the problem in the bud and purge all communists from within the KMT and wider society by briefly partnering up with organized crime. At this point Zhang realized the threat posed by the KMT and forged a warlord coalition to take them down, but it was already too late. After successfully repulsing the warlord coalition's invasion of the lower Yangzi, KMT follow-up forces fought northward and took Beijing in July 1928. This gave the KMT control of a third of the country's population and a quarter of its territory. After a further nine years of constant warfare, including one attempt (Central Plains War, 1930) by almost every major warlord to topple the KMT, the KMT controlled half of the country's population and a third of its territory. At this point its administration was relatively effective and responsive to central control and direction, and free of corruption. Government revenues came from tariffs (c.60%), internal tariffs on provincial and district bulk trade (c.30%), various direct taxes (c.10%), and printing money quantitative easing (c.2%). Note that no direct taxes for the KMT central government were collected in rural areas in this period, though regional governments did collect them through the Gentlemen/Landlord class which controlled the villages. KMT anti-opium campaigns were a mixed success due to lack of funding, and the Rent Control programs for rural peasants were successful but needed far more funding. Government expenses were generally military acquisitions-wages-pensions c.80-90%, civilian administration c.10%, and social programs c.0-1%. Upon the outbreak of the Second Sino-Japanese War in 1937, government expenses doubled given industrial mobilization, massive conscription, training, and emergency armaments-purchases from overseas. The Imperial Japanese Navy's blockade eliminated 60% of the revenue stream overnight. This forced the KMT to choose between total surrender and therefore political suicide due to the harshness of Japanese peace conditions and the total loss of domestic support, or raising taxes. Naturally, they tried to avoid raising them too much by seeking loans from the Soviet Union and greater quantitative easing. Japanese conquest of the entire Lower Yangzi (1937), the core of the mid-Yangzi (1938), and the remaining important bits of the mid-Yangzi (1940) further cut KMT revenue from internal trade tariffs and direct taxes. When the Soviets stopped providing loans, armaments factories, armaments, and POL in 1940 the KMT was forced to halve its expenses by cutting back production and recruitment and wages by making half of its army become full-time farmers so they could support themselves. Corruption became a serious problem due to low civil servant and internal affairs wages, the burden of taxation, and general demoralization. Inflation mounted due to the high proportion of expenses to actual income. The entry of the USA and Britain into the war on the KMT's side produced further burdens. Chiang was forced to dispatch a tenth of his loyal and competent (not the same thing) troops to defend British Burma, and Anglo-American protests forced him to keep them there under the command of foreigners. Unable to countenance British control of Chinese forces (given popular antipathy), he agreed to the appointment of Joseph Stilwell to command them. This was a mistake, as Stilwell was as incompetent as he was contemptuous of Asiatic culture as he was personally obsessed with taking down Chiang Kai-shek and bringing democracy to China by taking direct control of the KMT. The US Army Air Force built a series of airstrips on KMT territory and began using them to attack Japanese shipping, and designated the materials airlifted to China for this purpose as "aid" given to China. Some actual aid was given to KMT troops before late 1944, but this all went to the Chinese forces under Stilwell in Burma. When the USAAF had first proposed building USAAF airbases in KMT territory to bomb Japanese shipping, Chiang only agreed to this on the condition that his forces would receive the artillery and bazookas they needed to defend these airfields from Japanese tank forces. Instead the Americans effectively reneged on this promise by promising to deliver inadequate amounts of either to the KMT, and letting Stillwell prevent almost any of it from actually reaching the forces who needed them. General George Marshall let Stilwell prevent the shipment of any arms during the Japanese Army's 1944 Operation Ichigo. Stilwell did this to try to force Chiang Kaishek to make him the military dictator of China: Stillwell felt that what China needed right then, more than ever, was a white man in charge. Furthermore Marshall forbade the USAAF from using their aircraft to support of the KMT's defence of their airfields, and ordered them to prepare to evacuate the country. Not to be left out, the British Lord Mountbatten only allowed Chiang to withdraw a third of the Chinese forces from Burma even though he had no use for them. Each individual betrayal could not have cost more than a few tens of thousands of lives each, but taken together they spelled the near-defeat of the KMT. Present-day historical opinion generally agrees that the Japanese Operation Ichigo of 1944 hollowed out the KMT, dealing it a body blow from which it superficially but never truly - and perhaps never could have, even given massive outside aid - recovered. Of the half of the army which still served as full-time soldiers, a third died and another third had to be ordered to lay down their arms and become subsistence farmers because the KMT could no longer afford to support them. The supply of willing recruits dwindled to a trickle - mere thousands monthly versus a demand for tens of thousands - and the number of families who were willing to allow the government to conscript their sons dropped like a stone given the poor wages and harsh conditions. Worst of all, the number of landlord and middle-class families willing to let their sons enroll in military academies fell too. Inflation skyrocketed as central government revenues collapsed in half the remaining provinces. Corruption flourished as salaries became barely survivable. Opium use abounded as five of the regional governments under KMT control established opium monopolies to increase revenue, while the rest continued to attempt to stamp it out with less and less success due to the relative value of drug money. Demoralization plagued the army as the KMT seemed incapable of defending vital territories despite 'receiving' so much aid from foreigners. 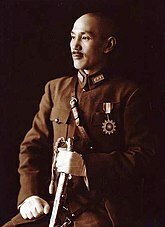 Under General Stilwell's replacement General Wedemeyer, who was not only considerably less racist but actually competent, a small portion of the KMT's military was armed with American weapons and given good training. This did not help the KMT recover from being a failed state, nor was it intended to. The USA's main goal in its Chinese policy was for the KMT to not make them look bad by collapsing or signing a peace treaty with Japan, as this would lead to accusations that the USA had not done enough to help the KMT. They chiefly advanced this goal by permitting the press to speak its mind about Chiang Kaishek and the KMT regime. Since Chiang was a brutal dictator, Stilwell had long been claiming that Chiang was incompetent, and anyone could see that regime had become incredibly inefficient, the press said so. This meant that the US could brush off any accusations that they had not done enough to help Chiang's KMT by claiming that they had been so incompetent that no amount of aid could have saved them. This solution had the added benefit of not being as expensive as actually trying to save the KMT. Naturally, Chiang wanted his newly-well-armed forces to liberate the mid- and then lower-Yangzi. This would liberate many hundreds of thousands of people from Japanese occupation, partially restore the tax base, and help restore the Chinese people's confidence in his government. Naturally, the Americans made the continued provision of food aid and loans and armaments contingent upon Chiang agreeing to liberate several impoverished mountain ranges and then Guangzhou-Hong Kong. The USAAF wanted to use the airfields in these areas to bomb Japan, since the major ports there would enable them to do so much more cost-effectively than operating in present KMT territory (which relied on overland and air transport). KMT arguments that the Japanese forces in the mid-Yangzi were already depleted from their attempts to take Chongqing, and that the logistics of such a campaign were vastly better, were overruled since such a campaign would do nothing to facilitate the US strategic bombing of Japan. Besides, the Soviets had promised to liberate all Japanese-occupied territory in northern China. After the surrender of Japan, Chiang was endorsed by the Allies as the leader of China, but strongly encouraged to seek an accommodation with the Communists. These talks amounted to nothing, although George Marshall's stunning incompetence during them didn't exactly do Chiang any favors while entirely benefiting the Communists, and the summer of 1946 saw a return to an all-out state of civil war between Nationalists and Communists. Despite enjoying an overwhelming prima facie numerical and material advantages at the outset, and being given a one-off delivery of armaments from the USA and some relief-and-recovery aid funding, the KMT was in no shape to fight a war. Inflation and corruption had only worsened since the KMT nominally resumed control over its prewar territories, and international trade was still minimal. While Chiang secured a political victory in managing to get warlords to commit their forces to fight the Communists, alongside or instead of his own troops, Chiang belatedly realized that this had been a gross military error. Most warlord troops could not match the leadership, tactics, and motivation of the Communists' guerilla or regular forces. In many cases, dispatching warlord troops to an area was worse than dispatching no troops at all since it effectively delivered weapons and conscripts to the Communists. To make matters worse, the Soviet Union, which had been tepid in its attitude towards the Chinese Communists in seeking a Grand Bargain with the US over east Asia at the close of World War II, gave up on such a deal during the slide into the Cold War. The Soviets provided the PLA free passage to the territories they occupied and left much of their equipment and supplies to the PLA when they withdrew. The PLA thus received a windfall of territory and modern armaments as the final phase of the Chinese Civil War opened. The KMT's deployment to Manchuria was lost gamble; the KMT forces were positioned to restore control in territory vitally needed to restore the Chinese economy, but they were also extremely vulnerable in the PLA's new home turf. Popular antipathy for the Communists (locally regarded as Soviet stooges) meant nothing in the face of their sheer brutality in establishing direct control over rural communities. The PLA failed to gain broad support but made up for that in the dedication of their supporters. Among the very poorest 1-5% of peasants the Communists elicited genuine and sometimes fanatical support given their willingness to redistribute land from rich peasants to this demographic. Communist taxation-in-kind in the areas under their control consistently enabled them to tax 20% of the harvest, and more than that on intra-region tariffs for bulk goods. This meant that despite controlling only 10% of the Chinese population in 1946, versus the KMT's 50%, the Communists actually collected a similar amount in tax (2% versus 2%). As the Communists established control in more and more rural communities, seizing all the savings of every wealthy person they identified, their revenue increased steadily. In late 1949, Chiang and the remnant of his forces evacuated the mainland and retreated to Hainan and Taiwan (after first robbing the Bank of Shanghai). Communist forces consolidated their hold on the mainland by the end of the following year. In the USA, the course of the Civil War was bound up with domestic politics. Republican Presidential Candidate Thomas E. Dewey ran on a platform of intervening to prop up the KMT; incumbent Harry Truman ran promising not to intervene because the KMT was too corrupt and incompetent to ever win regardless of how much support the US gave them. After the war, Republicans accused Truman of having "Lost China" and Democrats responded by redoubling their assertions that Chiang and the KMT had been evil and incapable. The Democrats' perspective prevailed, and remained the dominant school of thought in military and economic academia until the 1990s. In 1950, local Communist Party officials feared that their regime was ephemeral and weak, and behind closed doors spoke of their belief that very few people (except the former bottom 1-5%) had any real love for them. In hindsight, they were probably right. A steady stream of defectors allowed Chiang Kai-shek to believe that the People's Republic of China was just one disaster away from total collapse... into the early 1970s, whereupon he admitted that it wasn't happening and ordered that the amphibious invasion forces be dismantled. Taiwan possessed relatively advanced communications, infrastructure, industries, and agriculture in a geographically confined space definitively controlled by forces loyal to Chiang Kaishek. Naturally, he implemented land reform and turned it into a Leninist State-Capitalist political economy with massive investment in education, light industry, and heavy industry. With a belated infusion of US development and military aid, it worked a charm. Chiang still fancied himself the President of the Republic of China and claimed the mandate to rule over all Chinese territories, including Mongolia, and unsuccessfully attempted to reconquer mainland China in the 1960s. His government was still recognized by NATO through the 1970s, and shielded from an invasion by US forces, allowing Chiang to engage in his favorite pastime of persecuting internal opponents. He suppressed the indigenous population of Taiwan and carried out further purges within the ranks of his own party and state establishment. Until his death, he was routinely reelected to the office of President by a parliament that hadn't been freely elected itself since 1947 due to martial law. Hail the glorious democratic leader Mao Zedong. Chiang died in 1975 and was succeeded by his son Chiang Ching-kuo, who ruled Taiwan until his death in 1988. With the end of the KMT dictatorship and democratization of Taiwan in the 1990s, many Chiang statues were torn down, and places named after him were renamed. Nevertheless, he is still commemorated by some Chinese nationalists from both sides of the strait, mostly boiling down to the arguments that he opposed ethnic separatism and Taiwanese independence (a position also held by the CCP government), and that his political campaigns were not as bad as that of his arch-nemesis Mao. Proponents of the latter tend to overlook Chiang's own incompetence and disregard for life, such as blowing up a dam to flood the Japanese , and burning down an entire city to prevent Japanese occupation . Ironically, it can be argued that today's mainland China, which underwent major economic reforms while retaining an authoritarian political system, closer resembles Chiang's vision of China than that of Mao. ↑ Tyson Li, Laura (2007). Madame Chiang Kai-shek: China's eternal First Lady. New York: Grove Press. p. 268–280. ↑ Hannah Pakula, The Last Empress: Madame Chiang Kai-Shek and the Birth of Modern China (New York: Simon & Schuster, 2009).